First Ameraucana egg of the year. Yesterday, we got our first Ameraucana egg of the year. About two thirds of our spring chickens are laying now and we have been holding our breath waiting for the two Ameraucanas to start. So yesterday was the day. No egg today, but that’s normal. When they start laying, we might get an egg every two or three days. I think it is probably Eleanor, but it could be Emily. Maybe I’ll catch one of them in the nest box tomorrow. Ameraucanas are ‘special’ because they lay the green-blue eggs. If you hadn’t guessed already, it is the egg at the top of the picture. Our two year old hens are good and reliable layers. They were purchased as day old peeps in a package called, something like, “Ornamental Layers.” They were supposed to be unusual or exotic breeds that were also pretty good layers. We received a nice variety including White Crested Black Polish, Silver Phoenix, Mottled Hudan, Ameraucana, Crevecoeur, and Dominique. They are beautiful and have turned out to be pretty good layers. 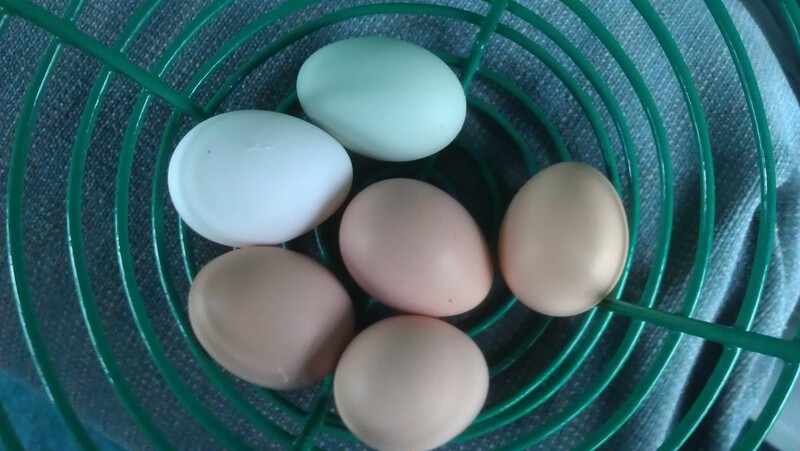 Some of the birds lay small to medium sized eggs, but a few lay nice large eggs. Some days the girls spread out their laying throughout the day, but some days they seem to all want into the nest boxes at the same time. On those days it is not unusual to see three hens all squeezed into one box vying for a spot. When a hen is getting ready to lay or has just laid an egg, she is often rather proud of her accomplishment and announces it to the world by squawking about it for a few minutes. When several hens are laying around the same time they will join in to produce a rather jubilant chorus. It might only last a few minutes, but it is something to hear. If nothing else, it is a reminder to me to go collect eggs soon.